I’m pleased to have with us today on the Trust Quotes series L.J. Rittenhouse, founder of Rittenhouse Rankings in New York. The mission of her company is to identify and encourage plain, direct and candid communications by companies. To that end, she produces the annual Rittenhouse CandorTM Rankings Survey, correlating measures of CEO candor with stock price performance. Her proprietary model allows her to sort, evaluate and quantify content as well as measure degrees of candor. The Rankings feel, to me, gut-level right. L.J. Rittenhouse is a 14-year shareholder of Warren Buffett’s Berkshire Hathaway, and author of Buffett’s Bites published by McGraw-Hill, due in bookstores by the end of April and available online today at Amazon.com, and BN.com. She not only has Buffett’s ear, but also his trust and confidence. She has an MBA from Columbia, and was an investment banker at Lehman Brothers until she left to start her own CEO advisory and investor relations firm in the early 1990’s. She consults with blue chip companies such as GE, Procter & Gamble, and Duke Energy as well as small and midcap companies. In 2002, she authored Do Business with People You Can Tru$t: Balancing Profits and Principles. CHG: L.J. thank you so much for doing this interview. 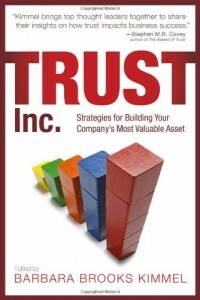 In 2002, your book Do Business with People you Can Tru$t was published and released at the Berkshire Hathaway meeting. How did you come to write about trust? LJR: I learned about the importance of trust when I joined the corporate finance department at Lehman Brothers in 1981. At that time, the entire firm (including the bankers) was devoted to serving our clients and maintaining the company’s reputation for reliable, top-quality work. Long-term relationships between clients and bankers were prized and nurtured. The early years at Lehman were fantastic; I worked with brilliant, ethical people. The culture was a true meritocracy. But by the mid-80’s this culture began to erode, due to the loosening of Glass Steagall regulations and increasing competition from foreign and domestic banks. I left Lehman in 1991 to start a CEO advisory and investor relations firm where I could work with many of my previous CEO clients. Together, we developed many programs and practices that were revolutionary, but are now the staple of IR programs: investor targeting, perceptual survey, and in-depth, informative, extended investor information sessions. Early on, I focused on the importance of creating trusting relationships with investors, and all of the company’s stakeholders. This notion that trust is the basis for success was not new, but was growing less important as investor holding periods shrank. Investors were growing increasingly impatient. They wanted to see steadily rising corporate earnings quarter after quarter. The temptation of companies to “manage” earnings became standard practice as investors rewarded companies who could expertly play this game. I worked with clients who chose to resist the pressure to play this short-term game. They instinctively hung on to the truth of an African proverb: If you know the beginning well, the end will not trouble you. I egged them on to begin thinking, writing and speaking with candor. My book, Do Business with People You Can Tru$t, is a guide to help clients, employees and investors to develop and to spot leaders who create candid, trustworthy communications. CHG: Don’t you actually measure degrees of candor in communications? LJR: That’s right. I developed a multivariate model that defines the seven key systems in a business and shows how these systems are balanced for sustained success. The center of this financial linguistic model is the system of capital stewardship. The model evolved from reading thousands of shareholder letters. Why shareholder letters? Because these communications are signed by the CEOs. The best letters, like Warren Buffett’s, are personal, engaging and educational. They demonstrate how a leader honors his words and word. Increasingly, the valuation of companies has turned on perceptions of the quality of CEO leadership. The CEO is the guardian (or destroyer) of the corporate culture and candor is essential to building effective cultures. A great deal about the integrity of the leadership and the corporate culture can be learned from financial linguistic analysis. Clear patterns emerged as I read these letters. Some letter topics were frequently repeated, while other topics were less frequently mentioned. These statements and patterns revealed the values, norms, practices and ultimately the degree of integrity in the corporate culture. I assigned values to each topic to create CEO communication scores. I gave positive points to straightforward information, and deductions to statements that were undeveloped, confusing and riddled with jargon and spin (corporate “FOG”) . It was surprising to find that many CEOs I worked for were most interested in seeing their FOG scores. CEOs were amazed when I showed them how the communications in their shareholder letters compared to other CEO letters. “I had no idea that anyone was doing this!” they’d exclaim. They began to see themselves as others saw them. This was not always pleasant. Sometimes the differences were stark. But gaining self-knowledge is essential to maintaining effective leadership. As Buffett reminds us, the CEO who misleads others in public may eventually mislead himself in private. By observing what topics were left out of their communications or were not fully developed, I helped my CEO clients to stretch their perceptual boundaries so they could more effectively engage in their internal and external environments. CHG: So what is the link between candor and trust as you see it? LJR: Actually, I consider the differences between candor, transparency and trust. Think back to 2003 when Sarbanes-Oxley legislation was passed to promote disclosure by imposing financial and criminal penalties for communications that were not transparent. It led to the biggest year-over-year jump in FOG scores since we began our surveys. Why? Instead of promoting transparency and candor, the threat of penalties opened the floodgates for jargon, clichés and all kinds of meaningless platitudes to appear in shareholder letters. This is the inevitable result of trying to replace moral standards with legal standards. Now consider the derivation of the word candor which goes back to the French word candere, meaning to shine or illuminate. It’s defined in the dictionary as “the ability to make judgments free from discrimination or dishonesty.” It is “the quality of being honest and straightforward in attitude and speech.” In other words, candor is about personal honesty, authenticity and the effort to shine light in dark places. Real candor starts when we are honest with ourselves. If we are, we are more likely to be honest with others: that’s a firm basis of trust. Trust and integrity result from walking our talk. If our talk is meaningless and confusing then our walk will be meandering and without purpose. Buffett knows this. He chooses candor as an operating principle at Berkshire Hathaway. It has served him well as Berkshire has become one of the most trusted and highly-valued enterprises in the world. CHG: You are a corporate finance expert and know how to analyze financials, but you choose to analyze the words in shareholders letters instead. Why choose shareholder letters, especially since many investors don’t believe they are even worth their time? LJR: You might say that The Rittenhouse Rankings CandorTM Survey supports that belief–that reading shareholder letters is a waste of time. Over the years, we have found that about one-third of the letters in our 100-company annual survey are reasonably well written and informative; some are even inspiring. Unfortunately, two-thirds of the letters are poorly written. In fact, the letters at the bottom quartile of our survey are dreadful. Many have more negative points (or FOG) than they score positive points. Why should investors care? Think about it: why would investors, customers and employees trust a CEO and a board of directors that publish letters full of obfuscation, confusion and unclear thinking? Won’t that send a signal to anyone wanting to work for, invest in or buy from a company, that it lacks integrity? It is so obvious, but amazingly, no one takes the time to consider this. CHG: Is there a correlation between candor and financial performance? If so, how strong is it? LJR: For the past five years we have correlated the stock prices of the top 25 and bottom 25-ranked companies. We have consistently found – in both bear and bull markets – that on average, the top companies outperform the bottom companies. In bear markets the gap is consistently wider than in bull markets. This is good news: It does pay to tell the truth. CHG: You seem to know Warren Buffett like few others do. In your new book, “Buffett’s Bites: The Essential Investor’s Guide to Warren Buffett’s Shareholder Letters” I’m curious about something that seems implicit: What’s Buffett’s view on the role of trust? LJR: When I first wrote to Buffett in 1997 about my work in analyzing CEO candor, he wrote back noting I was doing “the work of the angels.” He has consistently offered encouragement to continue this work. Avoid business involving moral risk: No matter what the rate, you can’t write good contracts with bad people. While most policyholders and clients are honorable and ethical, doing business with the few exceptions is usually expensive. In other words, for Buffett, trust is all about morality; about personal character. And acting morally can lead to dollars and cents business success, it’s not just about doing what is right. It’s expensive when you rely on people who are immoral. Buffett sizes people up quickly. He wants to see if you trustworthy and deserving of his time. If you gain his time and attention, you have passed his trust test. Seek CEOs who aid investor analysis and explain difficult concepts. CHG: Buffett is almost unique in the devotion of his shareholders. Can other companies replicate that? LJR: Name one other company CEO who believes as Buffett does that “while our form is corporate, our attitude is partnership.” Buffett’s communications are noteworthy for their candor because he practices the Golden Rule of investor partnership: communicate with investors the way you would want them to communicate with you – if they were managers. Because of this unique strategy, Buffett has been able to tap dance to work every day – as he likes to say. Why not? Berkshire shareholders are probably the most loyal investors on the planet. CHG: There is so much about Buffett that is interesting, but let me ask you to comment on two things. What is his view on private equity? What are his confessions? Why is Buffett so candid? First, he enjoys unmatched investor loyalty based on Berkshire’s track record: outperforming the S&P in all but six of the last 45 years and second, because the majority of his net worth is tied to Berkshire stock. He not only feels investor pain, he shares it. CHG: As someone who works at the highest levels of corporate management, you have the ear of some very prominent CEOs. What do you tell them? LJR: I tell CEOs what they often don’t want to hear, but need to hear. This is a high stakes strategy, but it can be very successful. Why? Because corporate success depends on tackling, rather than ignoring the elephants in the room. These “elephants” are typically the reasons why companies suffer and cannot achieve greater success. Worse, they will create conditions leading to serious problems. CEOs who can be open to hearing painful truths are truly great leaders. Typically, they have nurtured cultures, and promoted senior staff, who prize difficult and constructive debate and questioning. Generating sustainable, reliable financial results depends on taking actions that expose strategic blindspots. Not only does this lead to more motivated employees, more effective execution, stronger corporate value propositions and better stock price valuations – it mitigates future risks. I can tell from reading shareholder letters which leaders nurture healthy cultures and which do not. When I work with a CEO, I show them how they score on our candor benchmarks. Regrettably, it has been my experience that companies that could benefit most from confronting their candor deficiencies are those who choose not to listen. CHG: What do you think is the role of candor and trust in mending our broken world of economics and finance? Out of the news stories we tracked right after his letter was released, only six reporters commented on Buffett’s advocacy for imposing personal financial penalties related to reckless, destructive behavior by both boards of directors and CEOs. The other three reporters omitted boards of directors, stating only that CEOs should be personally liable. Our economic system is broken because boards of directors are not exercising their fiduciary responsibilities to read shareholder letters and insure that the CEOs they oversee are communicating candidly with investors. I have been to many annual meetings over the years and talked with board members. Never once have a met a director who can comment meaningfully about the shareholder letter. Similarly, boards of directors hire new CEOs. Why not ask all prospective CEO candidates to write a letter to shareholders as if they were now the CEO? These letters could become part a critical part of the selection process. For example, such a letter would reveal a great deal about the candidate – his or her ability to think clearly, and to effectively communicate the breadth and depth of their strategic vision. These are simple proposals to enact. Investors – the owners – need to demand they be implemented. Our work can show directors how effectively the CEO will fit into the corporate culture and fulfill his or her role as the company’s chief communicator and risk officer. CHG: L.J., thank you so much for sharing your insights with us today. I know I speak for Trust Matters readers in saying it’s been fascinating. This is number 8 in the Trust Quotes series.